One of my battalions of Spanish grenadiers has reached the stage of painting muskets. Since my brand new pot of Foundry Musket Stock Brown is thin and horrid (is it just me? 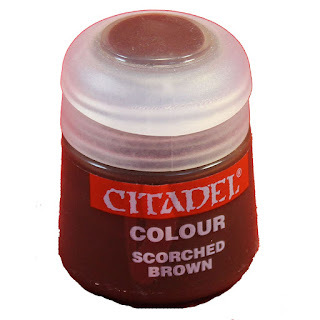 ), no matter what kind of stirring procedures I use, I resorted to an old pot of Citadel Scorched Brown. This is one of the Citadel pots from what I call their "in-between" period - i.e. after the old hexagonal pots which I used to like very much, and before the current pots, which have a captive plastic cap which will lock into an open position. The In-Betweens had a captive round cap, but it had no locking mechanism, and they absolutely refuse to stay open in a position that you can use for (let us say, for example) painting. For in-betweens on which I have relied in the past, I have tended to cut the lid free, so that it may be removed, complete with paint sample, and used as a little palette. Thus what happened today is all my own fault. I can claim nothing, really, beyond my own ineptitude, but there are certain, ergonomically unhelpful devices which can encourage my ineptitude to blossom, and - you guessed it - my wrestling with one of these stupid cut caps resulted in its popping off at some speed, and applying a spot of Scorched Brown to the living room carpet, just in front of my painting bureau. To my recollection, this is the first such paint accident I have had in many decades of model painting - and we are talking here of periods which included frequent removal of Humbrol enamel tinlet-lids with a screwdriver. I guess I should be grateful that my luck held for so long. 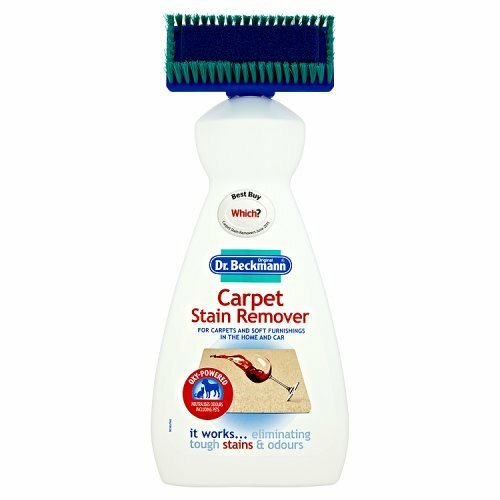 Having exhausted my supply of more easily-remembered terms of appropriate profanity, I have now committed all sorts of effort and cleaning materials to the scene of the accident. It is water-based paint, there was very little spilled, and the carpet is a light brown/beige colour anyway, so I am confident that it should come up pretty well - if necessary, I am sure that the Contesse's trusty steam cleaner, or even a little professional help, will get things back to normal. Thus I am currently in a period of cooling-down, while the rescue scene dries out a little, ready for the next phase. This has not helped painting progress at all, of course. Normally, you will realise, I bear no malice to anyone - well, maybe there are a very few exceptions, come to think of it, but generally life is too short to bear grudges. 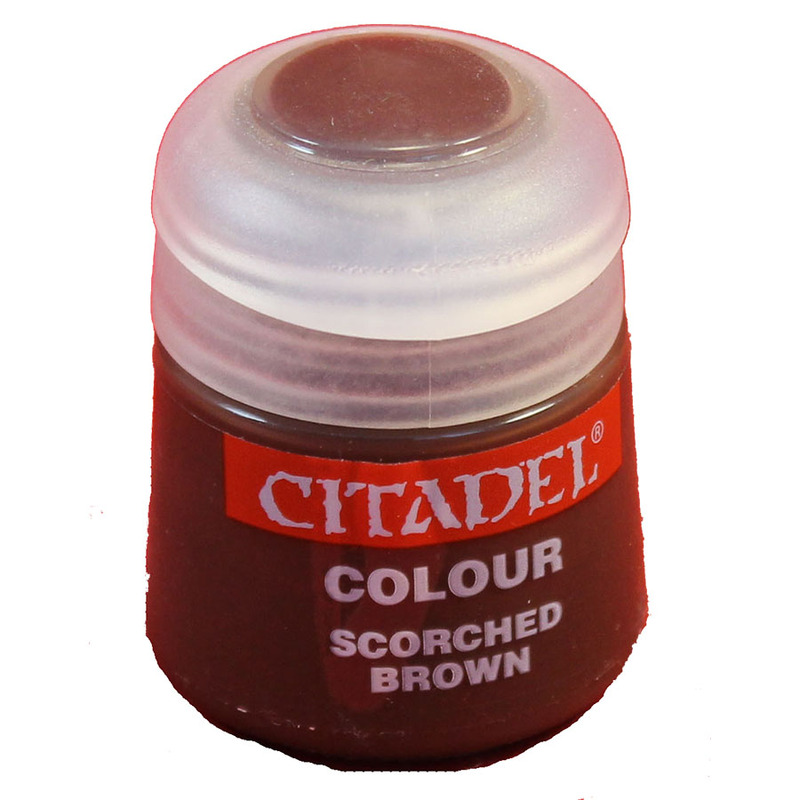 Today, though, I should like to single out Citadel paints for special mention. I sincerely wish that the hero who designed the pre-locking, in-between period cap for their paint pots might have one of his splendid caps inserted, rectally - ideally, to a position just below his tonsils. Just the cap? No bottle. One could build quite a thread of paint disaster stories, most of mine are way harder to explain, especially the ones concerning good clothing which one didn't mean to wear while painting or the time ...... Nice to have something so obviously a question of poor design. Those caps are a real pain in the arse, I recently had one -Mournfang Brown in my case, the only Citadel shade I still use - flick back at me while I was attempting to hold the damn top back whilst getting a bit of paint on the brush, dappled my hands and t shirt! Bad design, as you say. I just know that you wanted an update - carpet has now been steam-cleaned and hoovered, and it looks pretty good. When it's completely dry and the pile has recovered even I may forget it ever happened. I consider myself lucky, though, and I shall buy no more Citadel paints, though of course it would be infantile to blame them for my own stupidity.